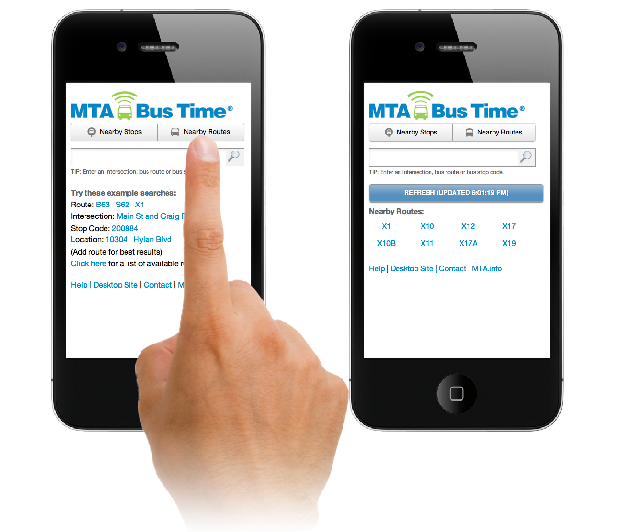 Check MTA Bus Time at the bus stop on your Android, iPhone, Blackberry or other smartphone by visiting http://bustime.mta.info/m in your mobile web browser or by scanning a QR code at a bus stop. This is also an accessibility-friendly text-only version of Bus Time. *Note: Bus Time is free to use but your mobile carrier charges may apply. You can use the GPS functionality on your smartphone to search for stops near your current location. Select either the Nearby Stops or Nearby Routes links at top. Your phone's browser may prompt you to permit MTA Bus Time to use the phone's current location. 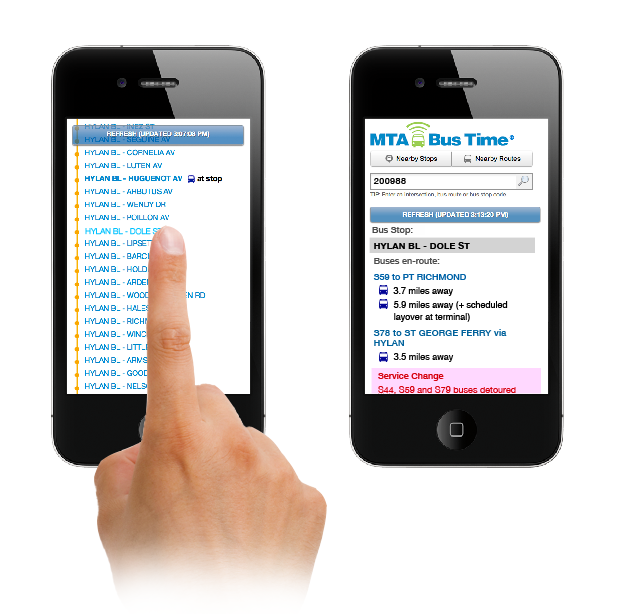 Once your location is found, MTA Bus Time will search for bus stops or bus routes nearby. The result is similar to a search by intersection. Searching by stop code returns a list of all routes that serve that stop, along with upcoming arrivals for each route, if any. Clicking on a route name shows the list of stops for the entire route (by direction). When you're at the bus stop, you can find that bus stop's code by looking at the schedule card posted at the stop on a bus pole. See Finding Your Bus Stop Code for more information. Visit http://mta/info/bustime/m on your smart phone. Enter a bus stop code in the search box. MTA Bus Time returns a list of routes serving that stop along with upcoming buses. Service notices applicable to the stop are displayed in red below the list of routes and upcoming arrivals. Clicking on a route name brings you to a page that shows all stops for the route, by direction. If you receive a "no results found for your query" message, verify the bus stop code you entered is correct, or try the suggestions under Troubleshooting. Searching for a route shows you all stops for a given route, by direction, with upcoming arrivals for each stop displayed next to the stop name. Clicking on any stop name brings you to the stop page, which shows routes and upcoming arrivals for just that stop (as outlined in the above section). 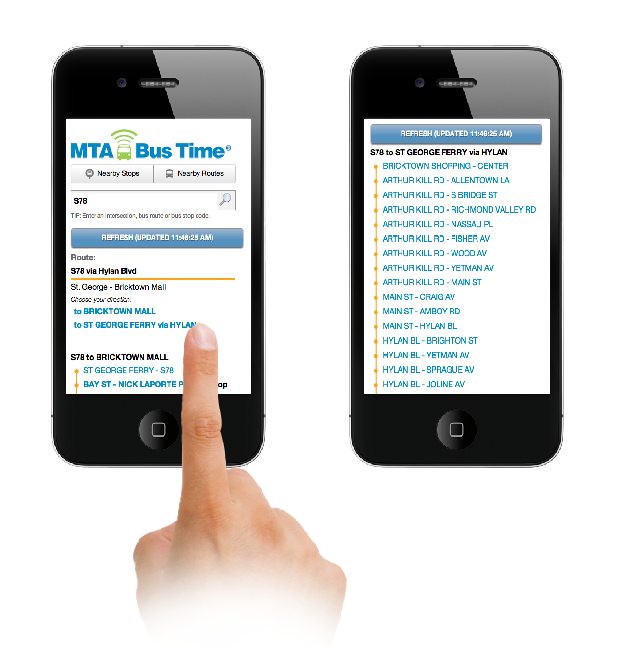 Visit http://bustime/mta/info/m on your mobile phone and search for a route. MTA Bus Time returns a list of route directions and a list stops for the route. Clicking on any stop name brings you to a page that shows upcoming arrivals for just that stop. Service alerts affecting a route are shown below the list of arrivals for that route. If you have trouble, try the suggestions under Troubleshooting. Searching for an intersection returns a list of all bus stops near that intersection, with upcoming arrivals for each stop, if any. Visit [http://bustime.mta.info/m] on your mobile phone and search for an intersection. MTA Bus Time returns a list of stops near the intersection you searched for, along with upcoming arrivals for each stop near that intersection. Clicking on any route name loads a page that shows all stops for the route. You can also be more specific and search for an intersection and a route. All nearby stops to the intersection that serve the given route are returned. You can also try searching by location, such as a ZIP code, address or point of interest such as "Eltingville Transit Center". Searching for a ZIP Code returns a list of bus routes in that area. Then select a route to view real-time bus locations along that route.